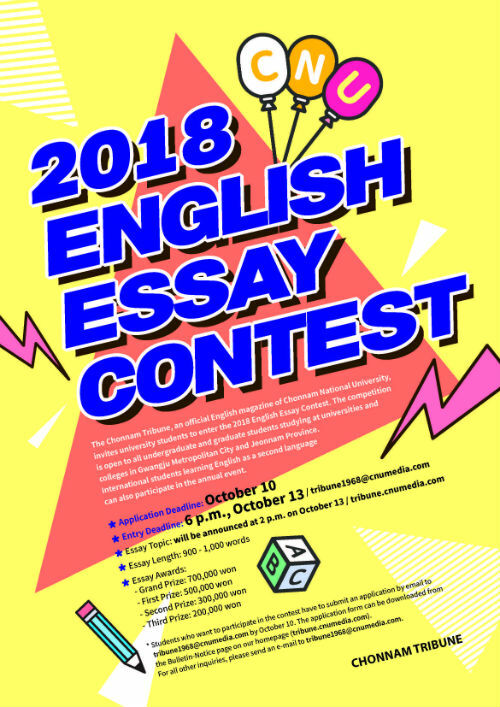 2018 English Essay Contest hosted by the Chonnam Tribune will be held from 2 p.m. to 6 p.m. on October 13. The topic will be announced on the the website (tribune.cnumedia.com) at 2 p.m. on the day of the contest. It is open to undergraduate and graduate students studying at universities and colleges in Gwangju and Jeonnam Province. International students learning English as a second language can also participate in the annual event. If you want to enter the contest, you should apply in advance and the application deadline is October 10.